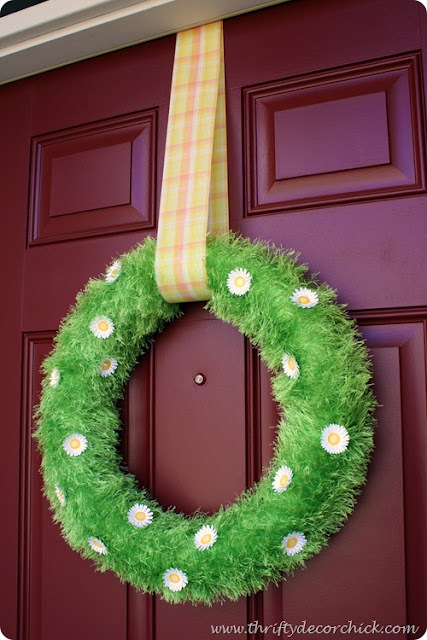 I love this fun Spring wreath that Sarah made for her front door. Even more fun is what she used for a wreath form. Forget about running to the craft store to find one, just look in last years pool supplies and dig up an old pool noodle! You can check out how to use a pool noodle as a wreath form and how to make this fun Spring wreath over at Thrifty Decor Chick. You can check out more Easter wreath ideas in my archives too! I have both of the pool noodle & the spring wreath pinned on pinterest as well. I love this wreath!